In the life of a high school student, stress is a dominating emotion. The increased importance of grades, the looming uncertainty of college and careers, the greater complexity of friendships and relationships, and the inescapability of all of this due to social media and the internet can be very stressful. At San Luis Obispo High School in California, students learn to manage their stress and anxiety while creating inclusive, positive friendships with their peers through Reach Club - a student-led club that promotes kindness, wellness and acceptance. With various activities that promote a campus culture of kindness, Reach strives to make sure everyone feels included. Reach puts on finals week study nights each trimester and hangs posters with inspirational tear-off quotes throughout the school. During March Kindness Month, Reach brings therapy dogs to school, has a coloring booth, and encourages students to write Kindness Month postcards, so students can send positive messages to their classmates, teachers and friends. Parent volunteers for Reach, Ana O’Sullivan and Kerri Mahoney, sought the expertise of Gina Biegel, LMFT, a psychotherapist, author and founder of Stressed Teens, and asked her to work with members of the club. Biegel, who specializes in mindfulness-based work with adolescents, has since facilitated stress reduction activities and mindfulness practices (which are defined as “noticing your thoughts, feelings, and physical sensations in the present moment without harmful judgement”) during campus visits and via Skype. As a member of Reach Club, I’ve personally benefited from Biegel’s guidance, and I recently had the opportunity to talk with her more and to learn about how parents can help their teens navigate stress. Communication: Listen to your teens! Truly pay attention to what they are saying without thinking of what to say back. Speak from your heart. Reflect on what you’ve heard them say so they know you were listening. Try not to judge them. Don’t ask “why” questions. You will often get defensive responses. Support and Encouragement: Teens often put a lot of pressure on themselves. Try your best to encourage but not add to the pressure they experience. Support them emotionally as well as financially. Awareness: Look for these “Red Flags:” changes in eating, sleeping, time spent with you and/or reduced enjoyment in previously favored activities. Love: Even in the hardest of moments with your teens, remember to let your teens know how much you love them - EVERY DAY! Love them enough to set boundaries when you need to be a parent and not a friend. Reach Club has made a positive impact on my life by making me less stressed while at school, and I think it has made school a more welcoming place for others. Our campus is pretty large, with about 1,500 students, but Reach makes our campus feel more intimate as we get to know a variety of people who may not be in our classes. I think that the activities during Kindness Month have the biggest effect on our campus, because when people receive the postcards, they are reminded that they matter and that they’ve made a positive impact on someone’s life. Reach is successful because it emphasizes getting to know schoolmates outside of the classroom - by getting to know their personalities, their hobbies and their interests. This cultivates a community environment where students feel at ease…and less stressed. Editor’s note: According to the American Psychological Association (APA), “American teens say they experience stress in patterns similar to adults, and during the school year they report stress levels even higher than those reported by adults.” A 2013 survey of adults and teens, conducted online on behalf of APA by Harris Interactive Inc., showed the following: 31% of teens reported feeling overwhelmed and 30% reported feeling depressed or sad as a result of stress. More than one-third of teens reported feeling tired (36%) and nearly one-quarter of teens (23%) reported skipping a meal due to stress. 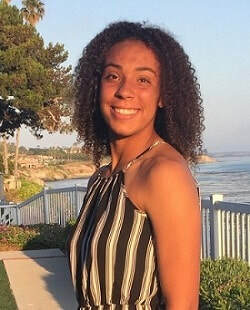 Ariana King is a rising senior at San Luis Obispo High School in California. She is a member of the varsity tennis team, plays violin in the San Luis Obispo Youth Symphony, and is a member of Reach Club, Model UN and Drama Club. She enjoys going to the beach and hanging out with friends and family.